Home/Posts/Uncategorized/Is Ruth too feminine for youth ministries? Like many ministries, our high school youth ministry held it’s winter retreat over Martin Luther King Jr. weekend. This year, our theme was Naked and Afraid: Vulnerability in Relationships. Throughout the weekend, the book of Ruth served as our anchor. I must admit, in the days and weeks leading up to our winter retreat, I began to heavily second guess my decision to explore this book. Since half the teens on my retreat were male, I wondered if I’d chosen a book that was too feminine; If, by choosing a book centered around two females, I’d isolate half my retreat audience in the process. Here’s what’s strange about that. In my youth ministry, I teach stories about the men in the Bible all the time. Never once have I worried about isolating the girls in my ministry. But as soon as I decided to explore a book of the Bible centered around women, I feared that guys would find it irrelevant – a notion our culture also reinforces. I mean, when’s the last time you saw a men’s Bible study discuss the book of Ruth? I’m guessing never. Yet, I’m hard-pressed to think of a women’s Bible study that hasn’t discussed this book. Here’s why this is problematic. If the Bible is meant for all people, in all times and places, then aren’t its contents also written for all people, in all times and places? When we intentionally choose ONLY to explore stories centered on women with other women, we contradict that. In doing so, we also reinforce gender stereotypes, many of which have haunted the church for years. If we never explore Biblical stories with strong female characters with guys, how can we expect them to believe that women have gifts to share with the greater church? If we leave female-oriented stories out of our teaching calendars for fear that guys will find them irrelevant, then how will both guys and girls learn what Godly women are like? If we label a Biblical book about friendships and love as “feminine”, how can we ever hope to teach guys to emote and to value their relationships with others… and with God? Having wrestled through those questions, in the end, I set aside my worries. During our three-day retreat, my entire ministry dove deeply into the book of Ruth, exploring both it’s characters and themes. Guys were just as enthralled by this story as girls were. It is, after all, a good story – something that captivates people, regardless of their gender. 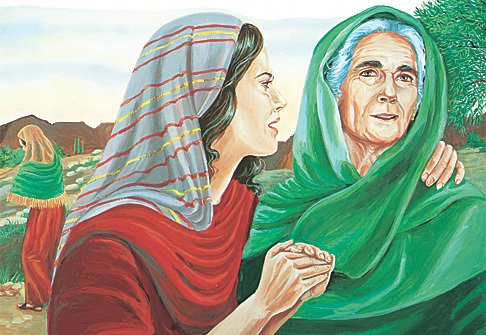 And as it turns out, the Holy Spirit didn’t stop working just because I chose to talk about Ruth and Naomi all weekend. Instead, the Holy Spirit moved in and amongst my teens. Both guys and girls found themselves – and God – in Ruth’s story. I definitely learned my lesson. When’s the last time you taught a female-centered Bible story to ALL the teens in your ministry? If it’s been a while, what’s kept you from doing so? However intentional or unintentional that’s been, what message does leaving out female-centered Bible stories send to the girls in your ministry? To the guys? My hope is that as youth workers, we’ll renew our commitment to teach stories about both men and women to the guys and girls in our ministries – knowing that both are important to our faith formation; That both have much to teach us; And that both are relevant to the world in which we live.